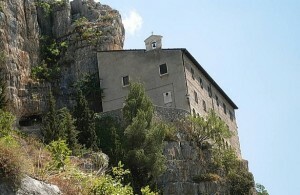 The Hermitage of Sant’Onofrio al Morrone, best known as Eremo di Santo Spirito, is one of the most suggestive places of the Maiella mountains, a steep place that looks out towards Sulmona valley; a place that inspires meditation and that welcomes the numerous pilgrims attracted by the virtues of a sacred cavern. Near Sulmona, the religious building placed on the slopes of the mount of Sant’Onofrio al Morrone keeps the memory of Pietro Angelerio (o Pietro da Morrone), the hermit monk that lived here and that became Pope in 1294 with the name of Celestino V and then became saint. Pietro arrived in Abruzzo between 1239 and 1241 and established himself on the slopes of Monte Morrone, in a cavern and afterwards wanted a little church to be built named Santa Maria in Ruta o in Gruttis. Inside the church there are some ruins of frescos of the XV century that represent Jesus Christ and Saint Giovanni Battista, and of some late paintings that represent a Madonna with the Jesus Child and Saint Lucia and Saint Apollonia; a ceiling made of a fine XV century wood decorates the barrel vault, inside of which two moderns altars erect with Saint Onofrio and Saint Antonio Abate and on the bottom of the milieu an arch opens that introduce into the little chapel of the oratory, full of frescos of the XIV century. The cavern, placed into the stone below the church, was the place where, according to tradition, Pietro Celestino retired to prayer; and it can be reached through an outer stairs that leads off ahead of the access arcade. At the entrance of the cavern, the “door of heaven” opens, whose notice that can be found in many sacred places in Italy and abroad “terribilis est locus iste hic domus dei est et porta coeli” (this place is striking. Here it is the house of god and the door of heaven) summons the pilgrims the entrance to a heavenly door that links to the Earth, the human and material world with the most sublime spirit to rejoin to it, to become pure and to heal from the earthly illnesses. We also inform that in Monte S.Angelo (FG) in Puglia, at only 200 km from Pescara, there is another cavern which is one of the most important orgonite caverns in Italy: the Cavern of Saint Michele Arcangelo, near which one of the most beautiful sanctuaries of the south of Italy has been built. Discover Abruzzo’s Mountain Park Majella with google Maps!